The latest round of lame NBA rumors focus squarely on Carmelo Anthony and his plans for next season. Never mind that he actually playing pretty well for the Nuggets right now all anyone cares about is what jersey he'll wear next season. At the moment it sounds like he is either going to re-sign with the Nugs, get traded to the Lakers, or wait until free agency and sign with the Knicks. That's all pretty boring though unless you are a Lakers or Knicks fan. Even if you do like those teams, they are already good teams and adding Carmelo might only make them a little better. What would be more fun is if we talk about possible rumors. That's right, rumors of rumors. 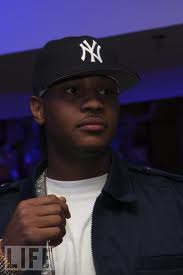 For example, based on that picture above, I think it's possible that Carmelo would sign with the Yankees. So to spice things up a bit in this slow post football pre baseball time I'm going to cover the Rumors of the Top 5 NBA Rumors. 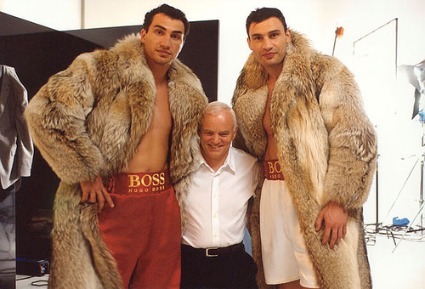 Mikhail Prokhorov announced yesterday that he planned to sign the Klitschko Brothers to the Nets. Although they are world class boxers, Prokhorov said that they would bring much needed talent to the team. He did not add that anyone who tried to drive on them would be punched in the face, but it seemed pretty clear. Sixers trade entire rosters with OKC Thunder and get the Clippers to throw in Blake Griffin too. In one of the biggest and most fascinating trades to ever happen in NBA history the 76ers management finally comes out looking like they know what's going on. Despite playing decently well to this point of the season, the simultaneous acquisition of Durant, Westbrook, and Griffin immediately make the Sixers the most exciting team in professional basketball. The Clippers decision to just flat out give away Griffin was shocking to everyone but the 10 people who follow the Clippers organization. Michael Jordan is coming back. Jordan apparently hoops it up regularly with the Bobcats and according to Gerald Henderson, he "still has it." Does he suit up for his own team or try to revitalize the Cavs just to show up LeBron? Carmelo signs with the Yankees. After being left out of the Cliff Lee, Adrian Gonzalez, and Carl Crawford signings, Yankee GM Brian Cashman just couldn't handle it. When he heard that Carmelo Anthony was thinking of signing somewhere in free agency, Cashman pulled the trigger just to prove to himself that he still had it. There was no reported position for Anthony in the Yankee roster at the time of reporting. Mutumbo is coming back! The Heat will be signing Nation Builder Dikembe Mutombo later this week to a one year contract as they look for help bolstering their roster. The Heat figure that he should be able to provide quality minutes and veteran leadership despite his incredibly funny voice. Major move out of the Sixers organization there.